To really appreciate Neuchâtel, consider hiring our local partner -- a professional tour guide who will show you around town, entertain you and share her extensive knowledge about the region. 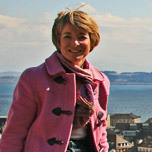 Like all city guides affiliated with LatLon-Europe, she is an expert who is passionate about her job. Allow me to introduce you to the treasures of our region -- the shores of Lake Neuchatel, the Old City or the charms of surrounding villages. I have been a guide since 1997 and have a master of arts in history as well as a post-graduate degree in tourism and heritage. My services include school programs, special-event tours, outings for conference attendees, treasure hunts, ’’team-building’’ sessions and tours for families relocating to the area. Tours can be customized for individuals, families or business groups, and range from a few hours to several days. Just tell me what you’re looking for and we’ll organize it together! Below are standard tours, which can be lengthened, shortened or combined. 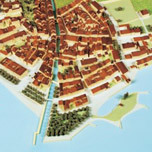 With its manageable size, Neuchâtel offers many options for visiting. 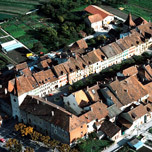 This tour follows the same general route as Tour 1, with more detailed commentary on Neuchatel masonry, its craftsmanship and its historical role in the town’s development. We stroll through the old city and explore the legacy of the Reformation. 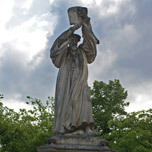 This small territory turned to the ``new’’ religion in 1530, becoming the first French-speaking territory to do so and preceding Geneva’s own embrace of the Reformation by six years. This interactive tour is particularly well suited for families or classes, as we hunt for traces of the Reformation together. We may also visit the Library to admire some of the great European treasures created during this time, including the Olivetan Bible, the Placards and the Livre des Marchands. We explore a thousand years of urban development, using seven scale models in the city’s historical museum. This is a good tour for a rainy day or a busy schedule. 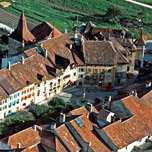 The Guide du Routard calls this town nestled between lake and vineyards “the loveliest village on the shores of Neuchâtel.” Modernity lives side by side with the past in this town of winemakers and fishermen. 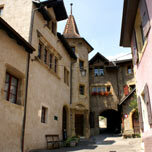 Here we will discover the legacy of the Renaissance in the castle, the winemakers’ houses and the picturesque streets. A wine tasting can be organized on demand at one of the numerous local cellars. The city of Le Landeron, built around 1325 on a drift in the midst of swamps, showcases three centuries of local architectural traditions and boasts artistic pieces of exceptional quality. This is a good tour for people who don’t want to do a lot of walking: Everything is within 300 meters. The tour ends with the chapel and the museum, and can continue with a wine tasting at a local cellar. We begin with a leisurely 40-minute walk from the train station to the Chapelle des Combes, with its magnificent view overlooking vineyards, the plain and two lakes. Inside, the chapel possesses charming baroque décor. After a meal in one of the picturesque local restaurants of the old village, we continue with the standard Tour 7, ending with a wine tasting.